If you’re thinking about starting a shaved ice business, you’ll want to start out by building a list of potential events that you would like to sell your product at. If you’re in the early stages of building your business and have not opened yet, it may seem daunting to think about where you will actually vend, but this won’t be the case for long. You will quickly find that there are almost an unlimited number of vending opportunities available in your area when you start to look around and take notice of all the different events in and around your community. It may seem hard to believe now, but within a few short months you could be turning down more opportunities than you accept. This post is here as a guide to serve as a way to not just get your creative juices flowing, but to help you determine the type of events that will generate the most revenue for you. As the operator of a business, you will soon find that there are plenty of vending opportunities that will come your way. But being able to identify the events and attend the events that bring in the most revenue will help you become more profitable. In this post we separate vending locations into two categories. 1.) $500+ Events and 2.) $50 – $300 events. The events that generate less than a couple hundred dollars per day are generally easier to find and will continue to be a reality as you run your business. But overtime you will replace smaller events with larger and more lucrative events for your business. It’s not hard to see why you need to focus on the higher end rather than the smaller events. If you attended six events that pay $500 each, you end up with $3,000 in gross profit. That’s not a bad revenue number considering you could technically work those locations in one week or complete that part-time on the weekends. On the flip side, you could attend 6 smaller events, work the same number of hours, and only generate $600 gross profit total. While you can still be profitable by working a small event and be paid better than a lot of part-time jobs, as the business owner it’s in your best interest to maximize revenue. County or city fairs that run multiple days. Popular events that attract thousands of visitors. Large music festivals that attract thousands of attendees over a weekend. Festivalnet.com – This website is the most comprehensive resource for special events available on the internet. On Festivalnet.com you can find listings of everything from art shows to craft fairs, music festivals and more. You can search for these events across all 50 United States and Canada. According to the website there are over 26,000 total events listed here. Tourism Websites – You can often find a list of local events on a tourism or city website. Just about any decent size city with a population of 50,000+ will publish events in their city online. University & College Websites – Colleges always have a lot of events going on. Whether it’s football games in the fall, basketball games in the winter or student council related events this can be a great resource to find out what’s happening in your community. Large fundraisers where you donate a certain percentage of each snow cone sales to a specific cause. Popular 5K and 10K runs. The attractive aspect of doing catering or working a corporate function is that you know exactly how much product you need and how much you’ll make before going to the event. This can help add some certainly to your monthly cash flow projections that you don’t usually get during a special event. Of course don’t just limit yourself to businesses with large corporate offices. There are personal events like weddings that command a higher price as well. While you may need to adjust how you present yourself slightly to book a wedding they can be extremely lucrative if you’re able to pick up a few of these a year. You may even be able to charge a premium during busy wedding days like Saturdays in the summer. The reality is that everyone starts out by attending events that aren’t very lucrative. That’s just the reality of this business! Sometimes there is rain, wind, or other weather related factors that prevent folks from getting out. Other times, less people show up than a promoter originally expected due to other events being held over the same weekend. Early on these smaller events are where you want to be. These events will give you the opportunity to get your process down for serving snow cones and shaved ice cups. You don’t want to go to a huge festival for your first event as you may get overwhelmed with the work if you’re still getting through that learning curve. Even while you’re at a small event, you can still take full advantage of your time there even if it’s not going to be a particularly big pay day. Make a point to get out and connect with the other vendors, whether they’re selling hot dogs or crafts at the event. These more experienced concession owners will know about some of the better events in the area and can help you establish more connections and points of contacts at other events. If you’re not the type of person that likes to put themselves out there and chat with people there’s an easy solution to that. 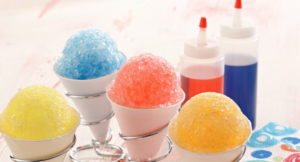 Since shaved ice is so low priced (it might cost you between $.10 – $.25 per cup) one great way to start the conversation is to offer other concession vendors free product. If it’s a hot day outside, no doubt other vendors will appreciate this gesture and the small effort could lead to thousands of dollars in returns if you end up getting connected with the right promoter or event as a result.